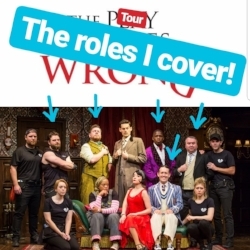 Michael has joined the cast of the Broadway hit, THE PLAY THAT GOES WRONG, making his Broadway debut on July, 25th 2018. He'll be understudying the roles of Robert and Trevor, as well as appearing several times a week as an Assistant Stage Manager in the show. For more information, click here! "You can’t have a successful Much Ado without a stellar Benedick and Beatrice, and both Michael Thatcher and Hayley Palmer excel. Thatcher captures Benedick’s simultaneous cockiness and vulnerability...The scene in which they first declare their mutual love and in which Beatrice insists that Benedick “kill Claudio” manages to be seamlessly funny, poignant, and deadly serious."